The study of computer science will prepare you to enter a fast-growing, exciting and ever-changing profession. We live in an utterly digital world. Whether you’re studying, socializing, working or playing, technology factors into nearly everything. Computer scientists create and optimize this digital environment, working where people and the technology they rely on intersect every day. As a computer scientist, you strive for elegance in function and appearance as you engineer innovative software solutions that make work and life easier. You may also obtain teaching certification in computer science. As a St. Norbert computer science student, you will work in several environments and have access to an experimental robotics laboratory and a Linux server dedicated to the discipline. Ongoing computer science projects in which you can get involved include the Computer Controlled Railroad, a variety of autonomous robots and mobile app development. And you’ll find we offer plenty of other opportunities to enrich your education in company with fellow students. Computer science internship opportunities help you prepare for professional life or academia. Many local companies hire interns for the summer, as well as for part-time work during the school year, providing opportunities to contribute to ongoing products and projects. In addition, faculty/student collaborations give you the chance to extend your knowledge and abilities while solving problems. When you study computer science at St. Norbert College, you’re a candidate for several scholarships. And the college’s study-abroad program enables you to take your computer science education overseas for a semester or a year. 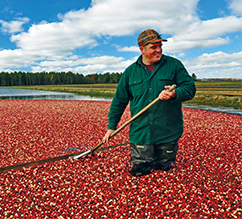 John Moss ’07 is putting his computer science skills to work on his family cranberry farm in Cranmoor, Wis.
After graduating from St. Norbert College, Moss worked for a software company and later started his own before taking over the family farm – but he didn’t leave his computer science skills behind. Moss has developed a smartphone app that controls and monitors the farm’s irrigation systems, and he’s also developing a record-keeping program that tracks equipment maintenance and more. Kayla Pope ’12 graduated with majors in computer science and mathematics. An undergraduate summer internship in 2011 introduced Pope to statistical programming, and she is now on a full fellowship at the University of Kentucky pursuing a graduate degree in this area. Her research work is with KIPRC (Kentucky Injury Prevention & Research Center), in which she is working with the state’s data repository for hospital, emergency-department and death-certificate data. Her first collaborative report analyzed data concerning injuries due to falls in the 65 and older population and will be included in a Kentucky senator’s request to fund fall-prevention programs.